The Euro 2016 finals in France should not be cancelled in the wake of Friday's deadly attacks in Paris, says tournament organiser Jacques Lambert. Islamic State claimed responsibility after 129 people were killed and more than 350 wounded in the French capital. Lambert, speaking on French radio station RTL, said: "Wondering whether Euro 2016 must be cancelled is playing the game of the terrorists. "The risk went up one level in January, it has just gone higher." It is the second time this year that Paris has suffered attacks. Over three days in early January, Islamist gunmen murdered 18 people after attacking satirical magazine Charlie Hebdo, a Jewish supermarket and a policewoman on patrol. However, Lambert said: "We will take the necessary decisions for Euro 2016 to take place in the best safety conditions. "Security in stadiums works well, the risk is more in the streets, in spontaneous gatherings." The European Championship final is scheduled to be played at the Stade de France on 10 July. 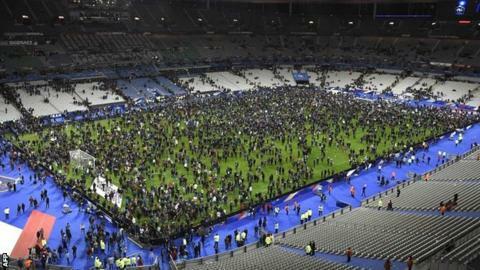 Four people died in explosions near the stadium on Friday, while France were playing a friendly against Germany. The Euro 2016 finals will be held at venues across France from 10 June. Several sporting fixtures in France have been postponed this weekend, including all European Rugby Champions Cup and Challenge Cup matches.